There are many rare insects in this world of ours—species that have been collected only once, and have never been seen since. Due to their diminutive size or retiring habits or a simple dearth of investigation by Homo sapiens, we have no idea of their habits or distribution; and so we cannot know their true range or abundance. Thus, I would reason that many "restricted" insects are no doubt only rare in the eye of a human beholder. 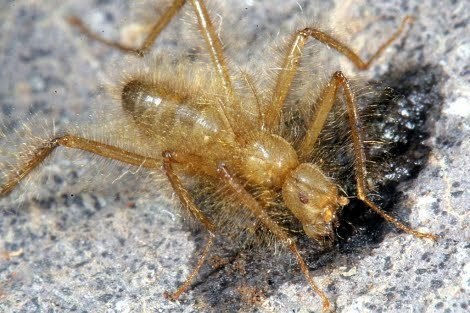 Another instance of a truly rare insect would be the primary subject of this post, the terrible hairy fly (Mormotomyia hirsuta), which is such a bizarre creature that it's placed in its own family (naturally dubbed Mormotomyiidae). Known only from a single crevasse cleaving a gigantic hilltop boulder (and a smaller, oblique nick in selfsame boulder) in northern Kenya (near Ukasi), this surreal creature has been seen only thrice since its discovery in 1933, and definitely not due to a lack of trying: seven attempts at collecting the terrible hairy fly have been mounted in the past 79 years, with only two of them having success. The dim, cave-like fissure is a roost for bats: and, where there are bats, there is guano. It is upon (and within) this that M. hirsuta's maggots feed (van Emden, 1950). This is hardly uncommon; guano is a very nutritious substance popular with all kinds of organisms, especially true fly larvae (Diptera): this is aptly demonstrated by the presence of no fewer than 6 families (not counting Mormotomyiidae) in the rich medium at Ukasi Hill (Kirk-Spriggs et al., 2011). 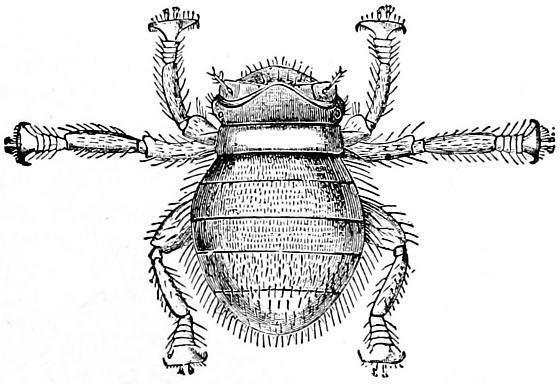 What is unusual is mormotomyiids' adult appearance: very hirsute (hence the name), with proportionally longer leg setae in males; no ocelli; gangly, and uncannily recalling a windscorpion (order Solifugae); and (most importantly) flightless, with the wings reduced to bristly projections (Austen, 1936). The long hair of males probably serves a function in sexual selection, making them appear larger (and therefore hardier) to potential mates (Copeland et al., 2011). The terrible hairy fly's morphology shows heavy specialization for a troglobitic (cave-dwelling) lifestyle; that much is clear. However, the adults' precise relationship with the bats upon which they indirectly depend remains uncertain (Kirk-Spriggs et al, 2011). Three families with a similar appearance—Streblidae, Nycteribiidae, and Mystacinobiidae—are notable here as points of comparison. 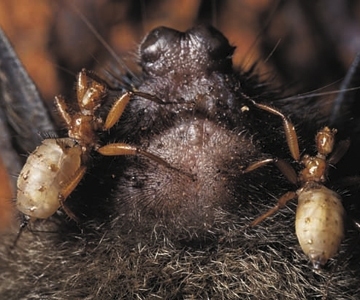 The former two (sometimes classified as a single family; Petersen et al., 2007) are known as "bat flies", and are louse-like bloodsuckers of bats (duh): nycteribiids are rather more advanced in this respect, being blind, wingless, tiny-headed, and never parting with their hosts (Peterson & Wenzel, 1987); conversely, some streblid bat flies retain their wings and/or sight (Whitaker, 1988). Bat flies are also ovoviviparous (meaning that the female's eggs hatch in utero): yet another adaptation to obligate parasitism (Bequart, 1940). Mormotomyia's mouthparts, though, are unequivocally not designed for puncturing skin—they merely sponge up liquids (van Emden, 1950). Hence, the theory that the terrible hairy fly is a bat ectoparasite can be ruled out. Perhaps, then, the subject of this post is more comparable to the members of the Mystacinobiidae, another monotypic family of weirdo flies which also happen to be the only eusocial dipterans (Piper, 2007). They are found only in New Zealand, which, aside from wetas and Peter Jackson (you gotta love that country), is inhabited by an endemic species of short-tailed bat that plays host to these flies. Mystacinobia zealandica, however, is not a sanguivore (blood-eater); instead, it subsists on the bats' secretions and excreta (Holloway, 1976). The New Zealand bat fly even spends a good deal of its time off-host: and thus its relationship with the creatures whose "fundiment" (to quote Geoffrey Chaucer) it eats isn't parasitic, but phoretic. Might the terrible hairy fly also be a bat cleaner? Extrapolating from its delicate long-legged habitus, which contrasts with the leathery muscularity of the flies seen above, probably not: the creature is free-living; a dasher-over-rocks, rather than a climber-through-fur (Kirk-Spriggs et al., 2011). Due to its peculiarity, the classification of Mormotomyiidae has been contentious, being included within two unrelated superfamilies: the Sphaeroceroidea (Austen, 1936; Griffiths, 1972; McAlpine, 1989) or Muscoidea (van Emden, 1950 and Pont, 1980). The two are unrelated, the latter belonging to the Calyptratae (a clade including blowflies, flesh flies, houseflies, etc.) and the former, Acalyptratae: a paraphyletic grab-bag consisting of all ptilinum*-bearing flies tha (aren<'t calyptrates. Study of the female genitalia (those dipterist perverts), by contrast, strongly indicates placement in the Ephydroidea (Acalyptratae; Kirk-Spriggs et al., 2011), along with the very familiar laboratory fruit fly (Drosophilidae): the only ephydroids that so much as superficially resemble the terrible hairy fly would be the bee lice (Braulidae), stocky, mite-like little (1.6 mm.) commensals of honeybees (see drawing below), formerly placed in the Carnoidea (Wiegmann, et al., 2011). Larvae grow up in the honeycomb (Ellis & Nalen, 2010); adults are freeloaders who cling to bees and steal food from their hosts' mouths. But now we must return to the terrible hairy fly itself. Its sporadic presence despite repeated searching is probably owed to the fact that rain is required to keep guano amicable to M. hirsuta maggots: and it so happens that the climate of northeastern Kenya is arid (c. 381 mm. of precipitation annually around Ukasi; Wright, 1964), with rain brief and very seasonal (Copeland et al., 2011). Thus, adults only make a brief annual (or semi-annual) appearance, their life-cycle being swiftly carried out while the weather permits, and remaining for the most part within the moist microclimate sustained inside their shaded clefts. It's probable that their eggs are capable of long periods of estivation in the times between life-giving torrents. So it is amply demonstrable that the terrible hairy fly is a creature intensively adapted for life in a very specific habitat; and that it cannot survive outside of said habitat. Moreover, the fact that the fly is a delicate creature, ill-shaped for phoresy, means that it is incapable of dispersal to new locales. Dormant eggs being carried off in guano stuck to birds' feet (by analogy to the similar phenomenon among seeds) is probably the only means by which terrible hairy flies could escape their cleft; but even if this happened, the likelihood of those eggs arriving in a hospitable environ remains a long shot. Therefore, it is most likely that the population on Ukasi Hill is the only one on Earth, a deduction confirmed by genetic evidence which also indicates a recent population bottleneck (Copeland et al., 2011). Even though M. hirsuta's numbers are good at the moment, the species remains very vulnerable. And whether or not you feel that the terrible hairy fly deserves our protection, I heartily hope that the sight that g reeted their discoverer, H. B. Sharpe—that of the flies drifting gently down from the walls " ... like feathers", borne by their long hair—will remain to be witnessed by humanity (or those members of it who happen to care) for many years to come. 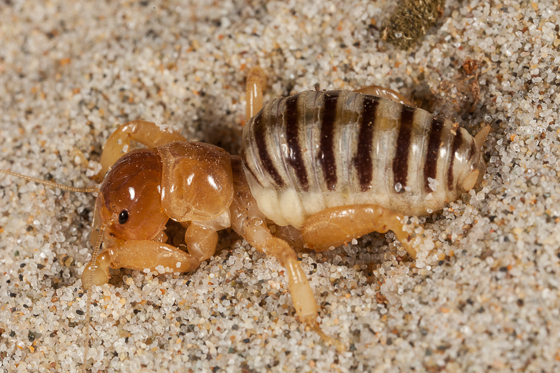 *The ptilinum is an inflatable sac located in a number of flies' heads (rather like an airbag): it is used to force open the end of the puparium to permit the new adult's eclosion. Afterwards, the ptilinum deflates, withdrawing into the head; a suture above the antennae's bases marks the place where it originated. The flies that bear this suture comprise a monophyletic group called the Schizophora (a subdivision of the infraorder Muscomorpha). Austen, E. E. (1936). A remarkable semi-apterous fly (Diptera) found in a cave in East Africa, and representing a new family, genus, and species. Proceedings of the Zoological Society of London, 425-431. Bequart, J. (1940). Moscas parasiticas pupiparas de Colombia y Panama. Acad. Colombiana Cienc. Exac. Fis. Nat., 3, 414-418. Griffiths, G. C. D. (1972). The Phylogenetic Classification of Diptera Cyclorrhapha, with Particular Reference to the Structure of the Male Postabdomen. The Hague: W. Junk. Holloway, B. A. (1976). A new bat-fly family from New Zealand (Diptera: Mystacinobiidae). New Zealand Journal of Zoology, 3, 279-301. McAlpine, J. F. (1989). Phylogeny and classification of the Muscomorpha. In Borkent, A.; McAlpine, J. F.; Wood, D. M.; and Woodley, N. E. (eds. ), Manual of Nearctic Diptera, vol. 2. Ottawa: Agriculture Canada , Biosystematics Research Center, monograph 28, pp. 1069-1072. Piper, R. (2007). Extraordinary Animals: an Encyclopedia of Curious and Unusual Animals. Westport: Greenwood Publishing Group. Pont, A. C. (1980). Superfamily Muscoidea. 81. Mormotomyiidae. In Crosskey, R. W. (ed. ), Catalogue of the Diptera of the Afrotropical Region. London: British Museum (Natural History), p. 713. Petersen, F. T.; Meier, R.; Kutty, S. N.; and Wiegmann, B. M. (2007). The phylogeny and evolution of host choice in the Hippoboscoidea (Diptera) as reconstructed using four molecular markers. Molecular Phylogenetics and Evolution, 45(1), 111-112. Peterson, B. V. and Wenzel, R. L. (1987). Nycteribiidae. In McAlpine, J. F.; Peterson, B. V.; Shewell, G. E.; Teskey, H. J.; Vockeroth, J. R.; and Wood, D. M. (eds. ), Manual of Nearctic Diptera, vol. 2, Minister of Supply & Services, Ottawa, monograph 28, pp. 1283-1301. Van Emden, F. I. (1950). Mormotomyia hirsuta Austen (Diptera) and its systematic position. Proceedings of the Royal Entomological Society of London (B), 19, 121-128. Whitaker, J. O. (1988). Collecting and preserving ectoparasites for ecological study. In Kunz, J. H. (ed. ), Ecological and Behavioral Methods for the Study of Bats. Washengton: Smithsonian Institution Press, pp. 459-675. Wiegmann, B. M.; Trautwein, M. D.; Winkler, I. S.; Barr, N. B.; Kim, J.; Lambkin, C.; Bertone, M. A.; Cassel, B. K.; Bayless, K. M.; Heimberg, A. M.; Wheeler, B. M.; Peterson, K. J.; Pape, T.; Sinclair, B. J.; Skevington, J. S.; Blagoderov, V.; Caravas, J; Kutty, S. N.; Schmidt-Ott, U.; Kampmeier, G. E.; Thompson, F. C.; Grimaldi, D. A.; Beckenbach, A. T.; Courtney, G. W.; Friedrich, M.; Meier, R.; and Yeates, D. K. (2011). Episodic radiations in the fly tree of life. Proceedings of the National Academy of Sciences, United States, 108. Wright, J. B. (1964). Geology of the Ndeyini Area. (Report #69.) Ministry of Natural Resources, Geological Survey of Kenya. Nairobi: Government Printer.